Michael Thomsen is a writer in New York and author of Levitate the Primate: Handjobs, Internet Dating and Other Issues for Men. Oculus Rift and the future of virtual reality were major talking points at CES this week. There&apos;s big business in VR development—for now, anyway. A lot of technologists think of themselves as makers. People who build things with computers have slowly fidgeted their way through a series of euphemistic descriptions for their vocation from hacker to code ninja, but maker seems to have become the best way for someone working in technology to describe what they do. They make things, and because the medium in which that making happens is limited only by imagination and experience, the thing itself matters less than the fact that the person is uniquely capable of making it. At CES this week, a convention hall tidal wave of trinkets, USB barnacles, and curving flatscreens all presented by their eager inventors in hopes of making a little money. The show is generally open about the redundant and exploitive reality of what being a “maker” actually entails, offering a million exaggerated variations on things that already exist, from a 700 pound iPod speaker dock to a rotating meat marination machine. There is a different possible future for maker culture, however, and it is emerging from the increasingly credible promise of virtual reality machines. The Oculus Rift, a motion tracking headset that fully covers a person’s eyes and delivers the impression of full 3D imagery, has been one of the rare success stories to emerge from the chaos of maker culture. Originally developed in a San Diego garage with a pair of snowboarding goggles and some cheap parts from a local electronics store, Oculus Rift has made the old idea of using computers to escape the present viable. Oculus Rift has yet to release a commercial product, but already software developers and members of the press using have made a cottage industry of experimenting with virtual reality esoterica, from haunting horror games to roller coaster simulators. It’s staggering to think the most exciting new technology of 2014 is a pair of digital blinders that change your viewing angle when you tilt your head, making it seem as if you are inhabiting the body of another person, while conveniently forgetting that you already have a body of your own. Following on Oculus’s success, PC giant Valve has announced major support for virtual reality, promising to release standard VR development kit in the next few days, and hosting a developer event later this month with a major emphasis on virtual reality. Valve’s Brian Coomer told BBC the company is currently developing technology “based around head-tracking and headset manufacture and design,” something which may be shown in more detail soon. Sony also announced a revision of its VR headset at CES, which can be used to watch movies and play games, though it will cost $1,000 compared to the Oculus Rift’s $300 development kit. The emergence of virtual reality has come at an opportune time for both video game culture and the technology market, which has left many uneasily bored with devices and services that seemed revolutionary five years ago but have just turned into boring old computer phones and tablets. Technologists never want the present to be what it is. All of yesterday’s most enthusiastic dreams only ever take us back to a present that is inescapably mundane. In pursuing this dream of using computers to deliver us from the boredom of our own bodies and indifference to our own thoughts, a startling shift has begun to occur. Before the the spectacle and sensoria of Oculus Rift and its gaggle of knock-offs, the migration into a hallucinatory digital realm had long been underway, creating a real split between the things people believed they were making and the medium they relied on for those things to exist. The material processes underwriting software and digital services are alien to the overwhelming majority of people who both use and create them. Even the gap between a line of Python code and its physical consequence, triggering the movement of energy through the invisible architecture of microprocessors, is incomparable to the level of abstraction that separated a maker from the thing he or she made before computers. Not many people can explain how car radiators work, but breaking their function down to the material basics and reconnecting those elements to the car’s functioning spans a much shorter distance than the chasm that now separates our software and the functional mechanisms that drive them. We have been waiting for virtual reality for decades and now that its mass audience arrival is imminent, it’s worth asking how it was we came to want a second reality. In a way, it’s staggering to think the most exciting new technology of 2014 is a pair of digital blinders that change your viewing angle when you tilt your head, making it seem as if you are inhabiting the body of another person, while conveniently forgetting that you already have a body of your own. Virtual reality creates its thrills by allowing the user to experience the extraordinary, and yet it does little to illuminate the forces in culture and politics that have left us so desiring of fantasy while there are so many practically attainable changes in our lives that we might engage with. Virtual reality may turn out to be the perfect object of maker culture. It’s becoming a revolutionary device that seems to be solving problems with reality, not by engaging with them, but by simply translating them into a medium where they’re turned into a distracting pleasure, something that draws paying customers to experience the mirage of progress as if it were something you could buy in a store. Michael Thomsen is Complex&apos;s tech columnist. 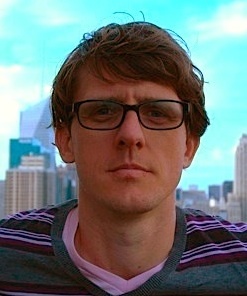 He has written for Slate, The Atlantic, The New Inquiry, NewYorker.com, Billboard, and is author of Levitate the Primate: Handjobs, Internet Dating, and Other Issues for Men. He tweets often at @mike_thomsen.